A leader of Google Inc.'s driverless car project said Wednesday that the company is in discussions with major auto insurance companies about the implications of integrating its technology into real-world vehicles. 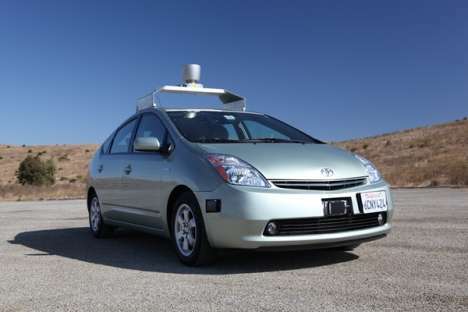 "They see the opportunities for this technology being really positive," said Anthony Levandowski, product manager for Google's self-driving car project, in a keynote address at the Society of Automotive Engineers World Congress at Cobo Center in Detroit. "From their point of view, this technology is not going to be released until it's safe." Levandowski declined to identify the insurers Google has spoken with, but he said the talks included a discussion of whether insurance policies for autonomous vehicle owners would include different rates based on when a person is driving and when the computer is driving. Google said in March that it had completed more than 200,000 miles of "computer-led driving" without incident. The Mountain View, Calif.-based technology giant has developed a complex software system that uses imaging, sensoring and modeling technologies to drive a vehicle mostly without help from an actual driver. Google is one of several companies, including major automakers, that are pursuing some form of autonomous vehicle technology, including advanced cruise control, for example. Levandowski, speaking to a group of several hundred engineers, acknowledged skeptics who say that autonomous vehicles "have always been 10 years away." "I think it's time for us to break that cycle and actually bring them to market sooner," he said. "I don't think we need to wait 10 years for the next model or body styles to come out to build this technology." He acknowledged that "we're not quite there yet" and that vehicles would likely never reach the point where the driver could fall asleep at the wheel for the entire ride. But he described driverless vehicle technology as a moral imperative. He said it could eliminate a "huge chunk" of the more than 30,000 fatalities that occur in vehicle accidents every year in the U.S.
"Every year we don't have this technology built, more people die," Levandowski said. Among the hurdles for Google - in addition to technology development - is the regulatory system. If government officials get skittish about autonomous vehicles or if insurers are scared off by liability issues, the technology could stall. Levandowski said he's hopeful that autonomous driving technology will be "allowed as long as it's safe." Some states, including Nevada and California, have already acted to ensure that autonomous vehicles are allowed. Levandowski, who joined Google in 2007 to help the company launch its Streetview product, said Google wants to partner with auto engineering leaders to advance the technology. "The biggest fear is not being able to inspire you guys because we need to work together on this," he said. "The real danger is the failure of our imagination." I do look forward to autonomous vehicles, even if they released the autonomous features bit by bit; I would trust a laser braking system more than the average human reaction time. They could also have all the cars linked up to a centralised server so they are aware of other vehicle positions, it would mean vehicles could automatically make room for emergency vehicles. I was involved in the DARPA Grand Challenge on one of the driverless car teams. Certainly these systems will have a role as safety equipment, such as automatic evasive maneuvers to avoid accidents, but the idea of a completely driverless car on public streets is a bit over-hyped. They do OK on typical looking roads, but throw in some odd intersections, strong sunset/rise sun glare, random potholes, and squirrels running across the street and see what happens. A completely driveless car would be more of a possibility if the government builds sensor aids into the road surface. If Google can't get car insurance companies to play along , they can just start their own. That would make a statement to their faith in the system. This is a NIGHTMARE for the gov't and the insurance industry. Imagine no more need for licenses , registration, traffic tickets or insurance all of which are supposedly instituted for "public safety". Very exciting! This could have a huge potential! Just think about lowering the cost and increasing the efficiency of busses! That alone is really big. Just imagine cutting the cost of taxis and busses by a factor of two...! Actually, the potential is much greater than this. Night busses do not have to be more expensive than day busses, and the same is true for taxis. This is potentially big, really big! One other aspect of autonomous autos, not mentioned, but which I imagine is being developed, is the potential ability to use routing algorithms to determine optimal paths. Reduce congestion, etc. Be able to tell passengers up front how long a trip will take, or conversely when is the best time to start a trip. All of which can and is already done by some GPS enabled systems. You dont really need an autonomous car for that. Seems to me that with the number of people driving impaired in someway, ie. drugs, age, mental capacity, etc. self-driving (or at least mostly self-driving cars) would be a godsend. I especially think of the elderly who are effectively isolated when they lose their divers license. ..I especially think of the elderly who are effectively isolated when they lose their drivers license. I agree completely. On the other hand, there are people who like to make stops out of impulse like, "oh, I have to stop at that store! - oh, I have to visit my friend!" but your car says, "no, you don't." Then the AI goes haywire when you try turning from the programmed navigation... Then Google says, "must have been a sunspot." Actually, Google is trying to get the insurance industry to buy into its 'driverless' vehicles. The auto insurance companies have a great deal to say about who, what and why is acceptable and legal on American roads. They seem to be winning on the mobile phone issue, but only just. Wonder what side they will come down on with driverless vehicles. Perhaps Googles deep pockets will help.